“Who’s Argie…,” Delores began. Her voice caught in her throat as an orange and black leg reached over the side of the old witch’s broom. Delores shook her head to clear her throat and tried to call out to her Aunt. She still couldn’t speak, but managed to wave her arms toward the broom straw where four spindly legs now clung. Aunt Rita turned to see the velvet head emerging over the end of the broom. “Took you long enough this time, Argie,” she called back to the spider with a laugh. “Maybe if you didn’t almost knock me out when you banged me against the wall, I’d be a little faster climbing up,” Argie called back, none too pleased. He pulled his enormous bulk onto the straw and perched there now behind Aunt Rita. “Close your mouth before you catch flies,” Aunt Rita said to Delores. “No, leave it open,” Argie interrupted, “I could use a snack. 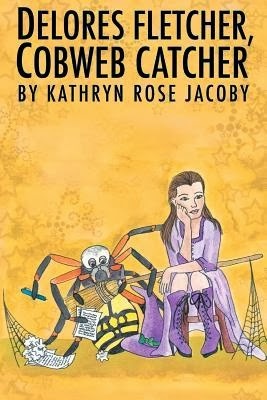 Welcome to the world of Cobweb Catching.” He extended a long leg toward Delores as her broom pulled up beside Aunt Rita. “Shake hands with your new business partner. Show some manners,” snapped Aunt Rita. Aunt Rita’s green eyes bored into the spider, who suddenly appeared to be checking out a mosquito flying dangerously close. “You know us, Rita, we’d never bite the heads off of the witches that feed us.” Argie inched back from Aunt Rita, now fully turned around on her broom.